This week was a very interesting challenge. 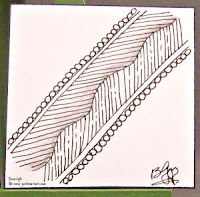 The Guest Blogger Holly Atwater, CZT makes audio Zentangle challenges. I wasn't familiar with this, but I found it a very interesting concept. 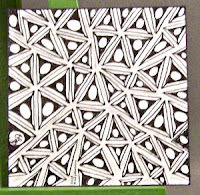 These tiles were done on what in Zentangle are Bijou tiles (2" X 2"). 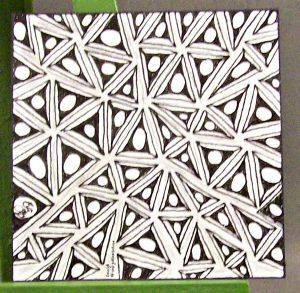 Before you start this challenge there is one little rule that you have to follow, there is no peeking at the other entrant's tiles because part of the exercise if to clear your mind and concentrate on your art and relaxing. The first 3 tiles counting from left to right, the same on row 2 are the Audio tiles, Audio 1, Audio 2, Audio 3. The concept is you have no idea what tangle you are going to do. You have your supplies in front of you in a quiet place (good luck with that one at my house, LOL), turn the audio on and be prepared to relax as you draw. I have to say at this point Holly has the perfect voice for this. My husband was sitting over from me on his computer and when he got through talking over what I was listening to he remarked, "that lady's voice would put me to sleep. Is that a relaxation tape?" At which point, still ignoring him, Holly was just getting into the first pen marks. 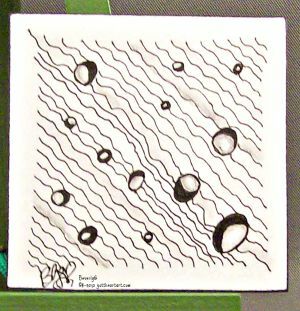 She tells you what to draw and how to draw it, you can pause if you need to catch up with where she is leading you and at the end of the audio she tells you to sign your tile and what tangle you have drawn. Audio 1 is Tripoli, Audio 2 is Nipa, Audio 3 is Meer. If you've never tried Audio tangling I would recommend clicking on this link to Holly's blog and give it a try. Very Relaxing! (if you can find a quiet place or like me you learn to tune out the people, cats, dogs, or whoever else you live for just a few minutes). 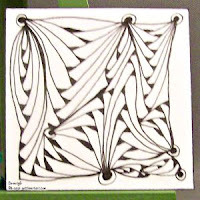 Onto the 4th tile in the series--another Bijou tile (2" X 2") done on your own using the tangle Betweed. 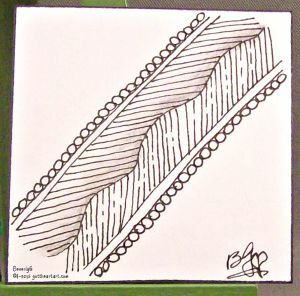 I first drew a string then filled in to achieve this monotangle tile. After you have completed one or more parts of this challenge then you are free to enter with the Mr. Linky, comment, and then browse around at the other entrant's results. Amazing how different each person's tangling is. Time for school pick up. YAY!!! Another wonderful over achiever!!! All of your tiles turned out beautifully! 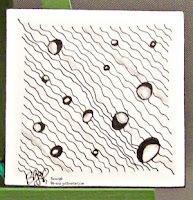 Wow... Look at that rounding on your Betweed tile... Lovely! 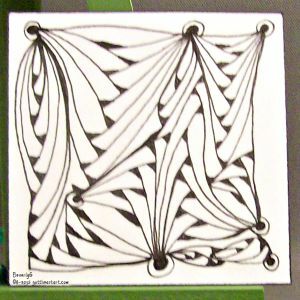 I like the depth and movement you captured in the Tripoli tile as well. Nice sparkles in Meer, and the holes in Nipa are great! I so appreciate your very kind words regarding the audios... Thank you very much! I am so pleased that you enjoyed them. You were very busy and with great results. You certainly were successful in following the meditations. Nice that you enjoyed it.